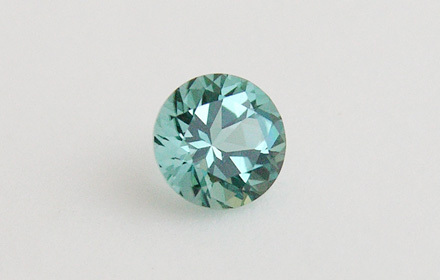 Weight: 0.17 ct; size: 3.49 | 3.49 | 2.46 mm; shape: round; colour: medium light very strongly bluish green; slightly greyish; clarity: eye clean; cut: good; treatment: none. Very clean specimen; good mixed style cut. Source: David Weinberg, Multicolour Gems Ltd.